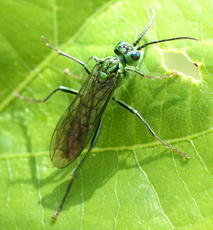 A distinctive green sawfly, with a green face, and darker green eyes. Though similar to the Rhogogaster genus, it has a thinner body. This is a poorly recorded species, but the records are well spread throughout Britain.